NovelSpot: Your debut novel, Not All Stars Sparkle, came out a year ago. Congratulations! At only 24, having a published novel is a pretty big deal. But you've been writing all your life. Did you know this is what you always wanted to do? 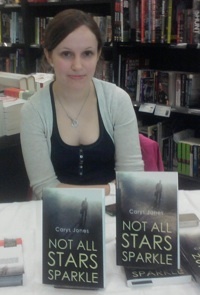 Carys Jones: Yes, every since I first read a book, I've known that I've wanted to weave stories of my own. From a young age I started writing little magazines and then moved on to short stories, but I always knew that I eventually wanted to write full length novels. Literature has always been a really big part of my life. NS: Can you tell us a little about Not All Stars Sparkle? CJ: Not All Stars Sparkle is a crime thriller set in America, following the main protagonist, Aiden Connelly, who relocates his young family to the small Southern town of Avalon in an attempt to escape the rat race of city life. Once there he takes on his first case, that of disgraced beauty queen, Brandy White, who is accused of murdering her husband in cold blood. On the surface it appears to be an open and shut case, as Brandy has already pleaded guilty, but as Aiden delves deeper in to the case he soon realizes that all is not as it seems and that the idyllic town of Avalon is hiding some very sinister secrets and it is up to him to uncover the truth before it is too late. NS: Your second novel, The Ice Cream Blonde, is about to be published. You're quite the whirlwind writer! How did you accomplish that? Write every day? CJ: Writing is my passion and whenever I have a spare moment, I'm on my computer lost in whichever story I am currently working on. In an ideal world I'd write every day, but usually there are a couple of days in the week when I don't. I find it cathartic and a pleasant escape from reality. NS: Can you tell us about The Ice Cream Blonde? I'm guessing it's not about actual ice cream. CJ: The Ice Cream Blonde tells the story of Thelma Todd, a Hollywood actress from the 1930s who was discovered dead in her car when she was only thirty years old and her death is still regarded as a mystery. It is a story which has intrigued me for many years and I also planned on revisiting it. I felt that Thelma's tragic tale deserved more attention and so I created my own story of what might have happened to her that fateful night. The Ice Cream Blonde was her nickname during the height of her career because of the colour of her hair. NS: Do you know the release date yet? CJ: Not yet, it is still going through the publication process which can be quite long winded. NS: Oh, how frustrating...it sounds like an exciting book. OK, just for fun, what is your favorite ice cream flavor? CJ: Raspberry ripple - sweet with a nice twist. NS: Both your first and second novel take place in America, but you live in England. The old adage is write what you know, so why did you choose to write about the US? CJ: For my first novel, Brandy was facing the death sentence for her crime, which was integral to the plot and her predicament, so I had to set the story in America for this to be possible. And with my second book, Thelma's life was Hollywood, so again the story dictated the setting. I have written some books set in England, but I enjoy the challenge of setting my stories somewhere more far flung. It adds to the overall sense of escapism. NS: What kind of research did you have to do? CJ: Normally when I write I give myself the creative freedom to not really need to do too much research, but as The Ice Cream Blonde was set in a very specific era I had to do a look of research in to the America of the 1930s, from what people wore, to how they spoke, even the places they would frequent socially. I hope that I have successfully captured a feel of the time within my book. NS: In addition to bookstores in England, I see that your début novel is available on Amazon.co.uk and Amazon.com. Any chance you'll be crossing the pond for book signings? CJ: I would absolutely love to do that but unfortunately the opportunity has not yet arisen but it is definitely something I'd be interested in doing. NS: Which scene in The Ice Cream Blonde the hardest to write? CJ: Thelma's childhood was difficult as I was taking what information I could find and elaborating and filling in the blanks to breathe life in to her, and also make her a rounded heroine so I was attributing qualities to her which are completely fictional, or may be, I'll never know. NS: Which was the most fun? CJ: Hollywood in the 1930s is often referred to as the golden era of cinema and it is easy to see why. Movies were just starting out and every time a picture was made, it was breaking new boundaries, and set against this was a world where film stars were almost seen as Gods, living completely different personal lives to the persona which they depicted on screen. It was such a fascinating time and I thoroughly enjoyed exploring it for my book. CJ: I read a wide variety of books, but one of my favourite authors is Jodi Picoult. I like how she takes the reader on a emotionally journey right along with her characters, and when something dramatic happens, she then helps the story resonate by having them go home and put on their favourite nightwear for comfort, something which you can relate to and instantly makes you empathizes with the character. She also tackles some really difficult subjects in her writing without sensationalizing anything which I really admire. NS: I'd love to get a glimpse of the writer at work. Computer or pen and paper? What's your ideal writing day? Mood music? CJ: I do all my planning on paper, and then work on my laptop which is nestled away in a quiet corner of my house, surrounded by lots of pink things as even though my writing is dark, I'm a very girly girl. I don't listen to music when I write, but I've been known to ignore the door bell and telephone, not deliberately, but because I'm so immersed in the story which I'm writing. I try to write little and often to keep everything fresh, rather than plough on for hours and let things become stale. CJ: I've just completed my sixth novel, which is a vampire tale entitled Sunkissed, and before that I wrote a British political thriller called Prime Deception. I like to work between genres as I find it interested and also a challenge. I'm having a hiatus at the moment before starting on my seventh novel, which I'm currently undecided upon what it will be. NS: Readers can find out more about you and your work on your website. Carys, thank you so much for taking the time to talk to us. CJ: Thank you very much for taking the time to interview me, I really appreciate it.